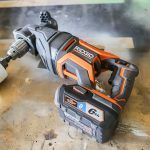 As part of The Home Depot’s ProSpective Tool Review program, we were able to check out the new RIDGID 15-Gauge Angled Finish Nailer and 4.5 Gal. Portable Electric Quiet Air Compressor. 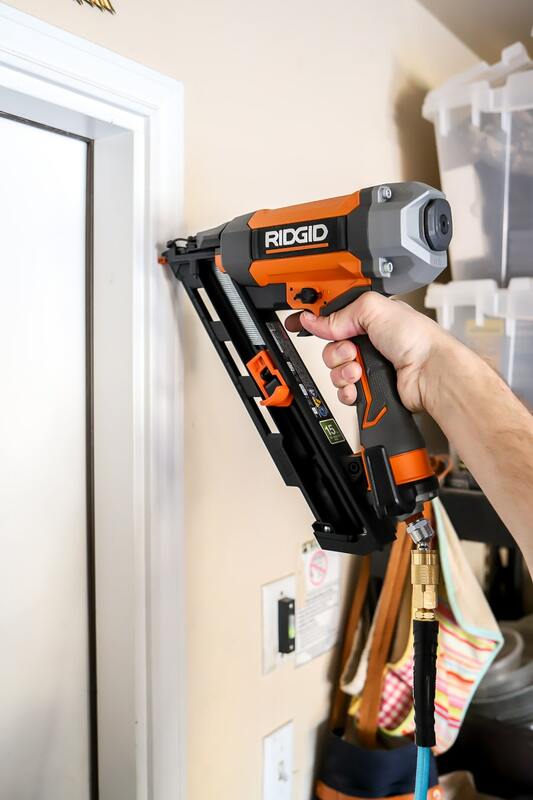 RIDGID boasts that this new nailer delivers over 17x more consecutive perfect drives versus the competition, which results in less time fixing and more time working. 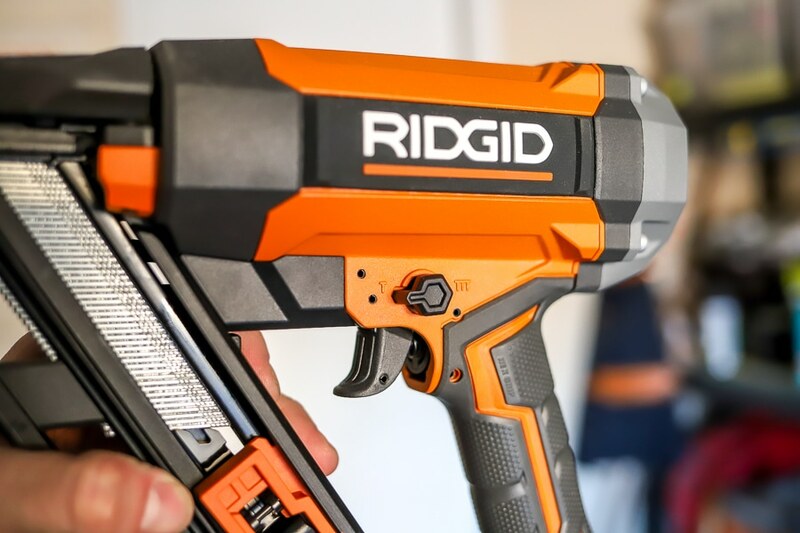 Unfortunately, we don’t have any previous experience with other finish nailers to compare, but we’ve always been really happy with RIDGID products, so we’re optimistic that RIDGID’s claims are legit. 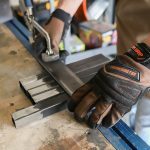 And their lifetime service agreement and warranty is hard to beat, so that alone, sets RIDGID apart from other tool brands in our book. While we won’t be installing trim or crown molding to our rental home anytime soon, we will be moving this summer! Texas has been great, but we’re eager to get closer to family further towards the east coast. And this time around, we’re so very excited to announce that we’re planning on buying a house! 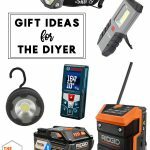 I can hardly contain myself because this has been a long time coming and I’m just dreaming up all the fun DIY projects and home renovations that are on the horizon. We are over the moon that we’re finally (finally!) going to be homeowners and I know this tool will come in handy at the new place. 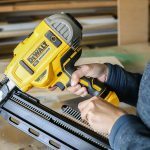 Let’s take closer look at the new angled finish nailer from RIDGID. It features Clean Drive™ – small nose for visibility, drives flush at angles, and no driver blade slip. You can also conveniently change between contact and sequential firing modes. 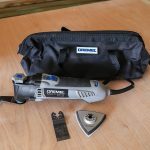 It has a Dry-Fire Lockout feature which extends the motor life and prevents misfires and a tool-free jam clearing door which provides easy access to clearing any jams that might occur. Loading is quick and simple with the rear-loading magazine and by-pass pusher. We paired this finish nailer with the new RIDGID 3.5 Gal. 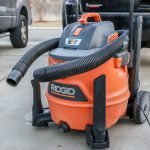 Portable Electric Quiet Compressor, which is backed by RIDGID’s 3-year limited warranty. It has a lightweight design, as far as compressors go – it’s more compact than other compressors we’ve seen. There is a locking regulator that knows how to prevent unwanted pressure changes and you can drain the tank with 1 turn with the 1/4-inch turn ball valve tank drain. 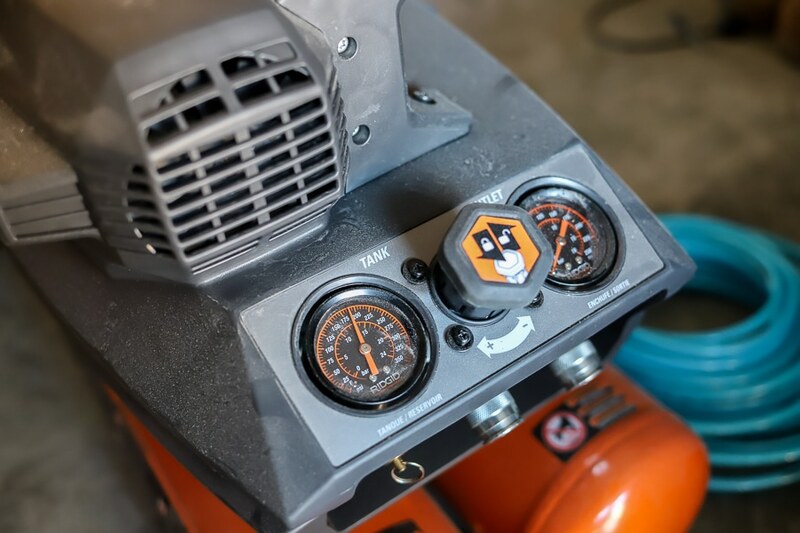 This compressor provides 200 PSI – the ideal pressure for the toughest applications. 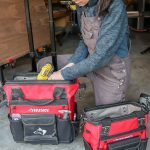 If you’re in the market for a new 15-gauge angled finish nailer and quiet and portable electric air compressor, check out these new products from RIDGID.